The air-cooled vintage Porsche market is little bonkers lately, with some folks paying upwards of six-figures or more for some rare specimen. Well, if you have a desire for an old Porsche but are working with a modest budget here is your chance, just make sure you get a tetanus shot. 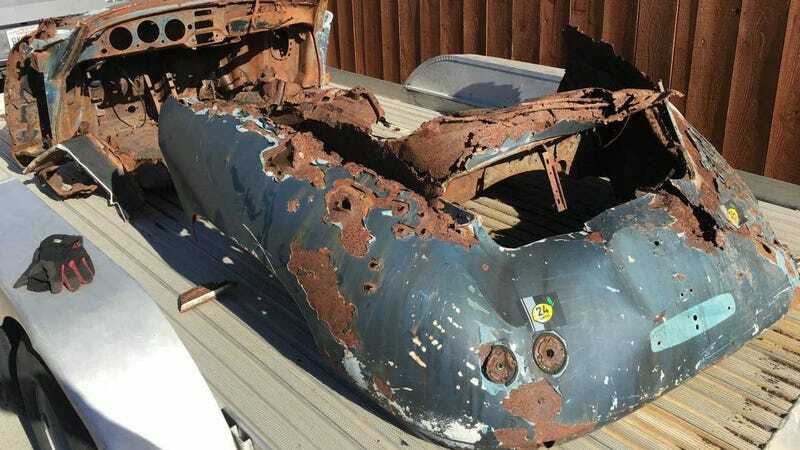 What we have here is what looks like a pile of rusted parts that are so decomposed even our own rusty savior, David Tracy would give a hard pass, but the owner claims this is a 1956 Porsche 356A. In case you were wondering the title is clean on this “car.” I’m sure there is a very serious Porsche man in SoCal who can see the potential in this rust pile and heed the call.